In this thrilling conclusion to the hit TV series Transformers Armada, Optimus Prime, his Autobots, and their human friends step up the fight against Megatron and his Decepticons for control of the powerful Mini-Cons. Valor, betrayal, redemption and some devastating twists fill these intense stories, leading to the unholy alliance between the natural enemies in the face of a genuine evil known as Unicron. The action comes fast and furious in this unforgettable chapter of the Transformers saga. Yes, that paragraph was the generic over-the-counter press description. Anywhere you find this 4 disc DVD box set, you'll find that description... literally, as it's on the back of the DVD case. But you know what? It works! It sums up this set very nicely. In fact, I doubt that I could do it any better... but seeing as how this is MY website, I'm sure as hell going to give it a try! 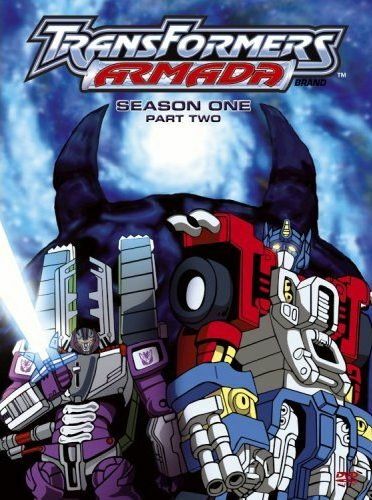 When Transformers Armada first came on-air, I only managed to catch the very first episode. Why? I dunno. Maybe it conflicted with another show TiVo was recording. Maybe I just forgot to set a season pass. Maybe I found the brats annoying. I really don't remember, but whatever reason, it means I basically completely missed this series. So when I got my grubby little paws on only the second half of this series, I really wasn't sure if I'd be able to just come into it and understand what all was going on and get into all the characters. This is an anime series after all, which have complete story arcs, unlike the 1980s cartoons which are all pretty much stand alone episode. Well y'all, I'm happy to report that coming into this series at the halfway point is okay. After only a few episodes, I had a decent understanding of what was going on, including the whole switching-sides double-crossing thing. Yeah, the story here is definitely that of an anime series. I can't say it's the best I ever seen, but I did enjoy it. I think part of that could have been because the kids didn't seem as prevalent as I remember them being in that first episode (I still found them a bit annoying, though), but also it seemed like there was more action. Of course, I really don't have a real base to say that, since I only saw the first episode and they did need to get the story set up and such. Basically, though, I was pleasantly surprised with it. Ah, and it gets really cool when Unicron joins the story. Now at first, I didn't really like the robot designs. They seemed very... I dunno... non-sleek... or disproportionate I guess would be the best way I can describe it. In the original series, when the vehicles transformed into robots, they also kind of morphed their shape so that appeared more humanoid in proportion, they didn't really look like a close adaptation of their toys. However, in the new series when the characters transform into their robot forms, they don't do this, as in they actually look like their toy versions. Their tires don't mysteriously disappear into some secret compartment and their limbs don't morph to make them look proportioned more like humans. It took a while for me to get used to this, but eventually I did. And I doubt anyone who hadn't seen the original show would even think twice about it. So, for all you 1980s Transformers fans out there who snubbed this show, you might want to reconsider and give it chance. If you'd like to learn more about this series and its characters, check out the Transformers Armada profile conveniently located right here at Absolute Anime!